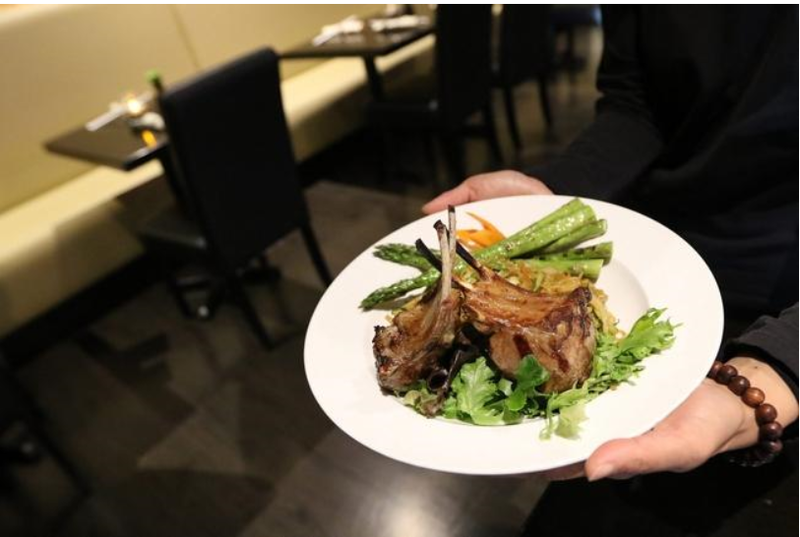 Learn more about Nobo Restaurant at 18 Boston Road in Chelmsford. Hometown: Jaffrey, N.H., moved to Chelmsford last year. Theresa Yu is originally from Hong Kong. How long have you worked here? : Opened since last March. Julian Yu: We are a modern Japanese restaurant. We take Japanese cuisine, and we incorporate pan-Asian and Western influences. Jon Yu: The name Nobo means, “no boundaries.” That is really what we are all about. Favorite dish on the menu: Theresa Yu: (Pan-seared) bacon, bacon, shrimp and scallop — the jumbo shrimp entree, because of the flavor. Julian Yu: My favorite would be the crispy Chilean sea bass, in spiced glaze with asparagus. Lightly buttered, with a nice glaze on top of it. Jon Yu: I’m a sushi fan. I like the fire maki special — spicy tuna roll, spicy crab roll and salmon jalapeño roll topped with an explosion of crunchy caviar and drizzled in three spicy sauces. Jon Yu: Each and every month, we have a specialty maki. For Thanksgiving, we have the maki gobbler — turkey, sweet potatoes and crabs. Julian Yu: Pretty much all turkey leftovers. Jon Yu: We have specialty makis for each season. Julian Yu: We have been changing a lot. A lot of the customers like to try new things. We take our menu seriously. We make 18 specialty meals. Julian Yu: We have gluten-free teriyaki sauce, and soy sauce we have access to. Theresa Yu: We have some vegetarian dishes. Julian Yu: We try to cater to all different types of dietary needs and palates. Jon Yu: Our distributors are all based in Boston, and in the Boston area. Julian Yu: For me, it’s the great interactions we have with the customers. Jon Yu: We are a family run restaurant. We treat our staff and customers as family. Theresa Yu: We recognize everyone’s names. Jon Yu: We have a very loyal following, through past restaurants we’ve had over the past 20 years. What makes Nobo stand apart from other restaurants in the area? Julian Yu: Jon and I essentially grew up in the restaurant business. We have learned from the ground up what it takes. Jon Yu: Once you take a look at our menu, you realize we are a completely different restaurant from what you are used to. We are very chic, very modern. There is nothing like it in the area. Julian Yu: We are very customer-centered. We make it our priority to have great relationships with our customers. Jon Yu: We are pretty much bringing the bigger Boston restaurant to the suburbs, while maintaining a close-knit family style. We are the best of both worlds. HOURS Monday through Thursday 11:30 a.m. to 10 p.m., Friday and Saturday 11:30 a.m. to 11 p.m., Sunday noon to 10 p.m.